Review where your marketing agency is at and the next steps you should take with our new tool A question I have been asked when I work with agencies to grow their digital marketing services is ‘how can we benchmark …..
5 Options for charging fees and paying for agency resource There are a wide range of agency costing and budgeting options for marketers to consider when outsourcing their marketing activities. The fees model used will vary by both type of ….. If you’re trying to market an agency, these 7 resources and our ‘Marketing your Agency’ guide will help you Where do you turn to, to check your Agency’s new business framework is as comprehensive and potentially as effective as it …..
Don’t leave account growth to chance, there’s a better approach We’re launching a new guide for agencies next week, in which I discuss my suggested approach to agency growth. The emphasis is very much on ‘planned’. To the point where …..
How digital agencies and consultants can use Discovery on digital marketing projects to improve the value they deliver to their customers Over the last few years, I have seen an increasing focus amongst agencies on improving their client discovery projects. In ….. Discover the digital skills your agency needs and how to develop your team Our recent guide to developing digital skills in your agency came about through conversations I have had with agency clients over the past few years. And from my …..
Who in the agency should work on discovery and how can you convince clients it should be paid for? 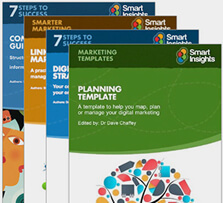 In the new Smart Insights Agency Guide to Discovery, I suggest a checklist of the areas you might explore as part of …..